Please tell me why you decided to study dentistry. Kato: I have been interested in medicine since I was in high school and I wished to enter a medical university. The reason why I chose a dental school is that I was fascinated to see dentists curing patients with their own hands. Kinanthi: Actually, since I was in senior high school I always thought it would be good if I had a job where I can help others, so I thought about getting a job in the medical field. My father actually advised me to become a medical doctor, but I said to him decisively that I didn’t want to be a medical doctor, but a dentist. Because I was more interested, or preferred to be a dentist, I thought becoming a dentist was very good for me. Since then, I focused on my thinking and tried to enter the dentistry school, and I could enter the university’s faculty of dentistry. Kinanthi san, could you tell me a little bit about the environment surrounding dentists in your country? Kinanthi: Well, because my country is a developing country, it is still difficult for many people to access appropriate medical or dental treatment. Additionally, the number of the dentists or medical doctors is still low. The number of patients who need care is greater than that of such specialists. This is one of the reasons why I want to be a dentist because I see the situation in this way. Also in our country, becoming a dentist or a medical doctor occupies a very high position in social status. And now you are studying in a foreign country, eating different food in a different culture. Why did you decide to come to Japan? 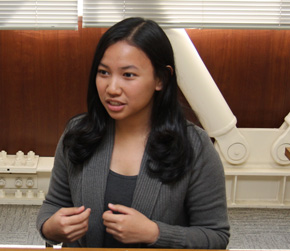 Kinanthi: I think studying abroad in Japan is a very good opportunity because Japan is a developed country with a very sophisticated high-technology, and also good education. Coming to Japan was a very good chance for me to develop myself, and I want to be different among my colleagues in my faculty. I thought that if I can take this chance, it means I get a chance to go one step ahead of my colleagues so I didn’t want to lose this chance to come here. Kato san, how did you prepare for the entrance examination of Hiroshima University? Kato: When I was at high school, my study was not so entrance exam-focused. I used almost no private tutors and nor did I use prep schools. But I did my best to do my homework and regular tests well. It was more like studying in accordance with the school curriculum. Kinanthi san, you described this opportunity as a “chance to go one step ahead of your colleagues”, but wasn’t it difficult to pass the selection to enter the HU International Dental Course? Kinanthi: Yes, it was quite hard. In my university, we have an internal selection process to choose only one or two students to be dispatched for this program. At that time, there were two people who were selected and it all depended on the grades or marks. Specifically, my university firstly selected some candidates who had high marks in the first year of our study, and after that we had some selections through interviews or essays. 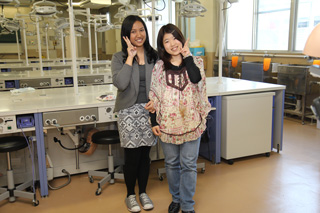 Finally, after internal selections, there was a selection from the Faculty of Dentistry of Hiroshima University. They interviewed us. Anyway, the competition was fierce because other candidates also had very good marks. Maybe I was lucky! What’s your impression when you actually came to Japan and took your first class in Hiroshima University? Kinanthi: Well, the first time I felt so nervous and worried about how the classes would be like, because that was the first time for me to study abroad, and I didn’t know how my study or my friends or teachers here would be. I think my friends and teachers were very welcoming and nice. Maybe the first time, I was a little bit nervous because of communication and I couldn’t speak Japanese well and it was a little bit difficult to have a conversation, but after that, it became better because we became closer and closer. I think it’s OK now! And I like Japanese students very much. They always try to do their best in everything. So I like this characteristic of Japanese people. Kato san, how is it to study in the same class together with international students? Kato: It is always very stimulating. The international students not only take part in the lecture but also voluntarily read English text books and study. I think that I should try hard like them! Additionally, when I study together with international students, I also have the chance to know what the education and the situation of dentistry is like in their countries. It is quite interesting. About “dual linguistic education system”, in your class, teachers use both English and Japanese. Is it comfortable for you using multiple languages at the same time in the same class? Kinanthi: I think yes. As my generation is the first to apply the Japanese - English dual linguistic education system, it’s maybe a little bit difficult not only for the teachers but also for the students. Even for regular students I think it’s very difficult because they are used to studying comfortably in Japanese only, but now they have to study in English, too. As for me, English is not my mother language so it’s also sometimes difficult for me to study in English. But I think the dual linguistic education system is a good system because we can study more. For regular students they have to study in Japanese and in English, so they can gain more knowledge. In our case, we study in English and also try to study in our languages too. So I think it’s a very good system even though it’s a little bit hard for us. Kato: To be honest, at the beginning I felt a little bit awkward. Some of the teachers used more English, and some more Japanese and less English. At the beginning I was struggling to keep up with the lectures. But when regular students can hear both languages, they have the chance to learn the English terminology and improve their English in general. I think I am lucky to be part of this generation. What disciplines or practical trainings do you like most? Kato: Actually I like practical training, where we can discuss with each other. But I also like it when a teacher “makes a quick digression” and talks about his/her personal experiences as an international student or researcher. Almost all of our teachers have experiences of having studied abroad. It is fun to see photos or to hear what they have acquired. Some of the teachers talk about their experiences after every chapter. Kinanthi: I like practice such as anatomy. Because as you may know, in the class such as a lecture we just sit and listen to the lecturer but during practice, we can communicate with each other, help each other and ask something. How about the teachers’ instructions during the lessons? Are they easy to understand? Kinanthi: I think it’s quite good. Because even in some practice, first they only explain in Japanese, but after that the teachers come to international students and explain clearly about the instructions of the practice. So it’s understandable. Kato: Yes, I agree. But I think lectures like this must be especially hard for the teachers. They always try hard to make a lecture understandable for both regular and international students. I see. Are the teachers writing on the blackboard? Kato: No, all of the teachers use PowerPoint in their lessons. In each slide there is text written in Japanese and English. The teacher reads both and also gives more detailed information. How long do you study at home? Kinanthi: Well, it depends on my subject. If I have practice until late, I just study for several hours. If I have test or examination, I need to study more until late. I often use the library, too. Kato: To say the truth, I almost never study at home. I study at the university’s library at night. Is the university’s library user-friendly? Kato: Yes, very. In the Kasumi Library, we have a learning space with computers and a network environment called “BIBLA Kasumi”, where we can have a discussion during study. And you can use it for 24 hours. So, during test week etc., I often go there and study until the next morning because it is open the whole day. Kinanthi: I am quite satisfied, too. Because when I came here there were many English books which were prepared for us. So if I need additional books I can make a request to the library. I think almost all of the English books are well provided so we can use them. What do you do when you encounter a difficulty? Kato: First of all, I try to avoid leaving it until later. I feel sick if I just think “How frustrating!” So, first of all, I take time out and think about why and how this happened and what would be best thing to do. When I finally make up my mind, I say “Okay!” and start to take action immediately, clearing one problem after the other. Kinanthi: When I have trouble, I usually ask my international friends or Japanese friends, or teachers or seniors. Coming to Japan alone for the first time was a little difficult because I had to adapt to new things. So at that time, it was very hard for me, so if I had some trouble, I tried to speak with my friends or teachers or seniors, and they kindly helped me. But nowadays such problems don’t bother me because I’m already enjoying my life here so it has become better. Kinanthi: I usually hang out with my friends in Hiroshima City or sometimes watch movies, Hollywood movies, or sometimes if I have time I Skype with my family and talk with my mother or father. So I don’t get homesick (laughs)! Kato: I read books at home and relax. I like novels. 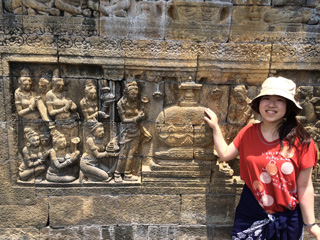 This spring holiday, I went to Indonesia for studying. There, I met Kinanthi. 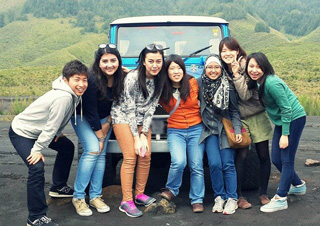 I met those international students who had visited Japan last year for the 6 month-study-program. We studied and had a nice time together. 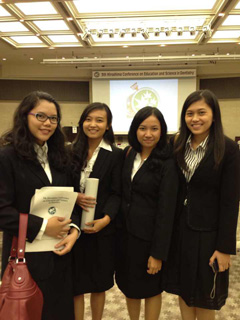 Tell me the impression about your study abroad in Indonesia. Kato: To be honest, it was much more developed than I thought. The students are studying by actually treating patients. I was also surprised to see that the equipment seemed to be good. In Japan, students can observe a dentist’s work at the hospital as assistants, but they are not allowed to treat patients independently before passing the national exam. However in Indonesia or Vietnam, treating patients under instructors’ supervision is part of the curriculum of dental students. I think that is the difference among us. Do you often take part in university or local events? Kato: Yes, I am a member of HUDIC, an international exchange club of the Faculty of Dentistry and often join international exchange events. Once, we went on an excursion to Akitakata City to watch Kagura and also went to the Kintai Bridge in Yamaguchi Prefecture. In addition, I go to Miyajima together with newly arrived foreign students and guide them. Kinanthi: Last year, we attended the Hiroshima University Kasumi Festival, and international students and regular students who belong to the HUDIC sold some food together. There also were other international events at Ryugakusei-kaikan. 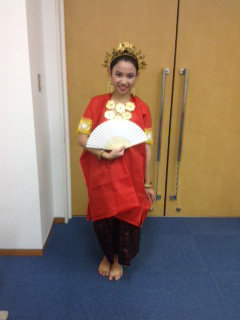 I sold Indonesian food. When there are local festivals in Hiroshima like the Hiroshima Flower Festival, I usually go with Japanese or Indonesian friends. I really enjoy those events. Do you have any advice for your juniors planning to enter the Faculty of Dentistry? Kato: First of all, studying is most important. At high school, you don’t have to obtain the specialist knowledge of dentistry at all. Just continue to study hard as a high school student. As for the study after entering the university, you may think that all a dentist has to do is to treat bad teeth, but dental students don’t learn only about teeth, but also other parts such as the tongue, the oral mucous membrane or the jawbones, as well as all parts of the head and neck. If somebody is interested in that, I recommend they take it up as a challenge. 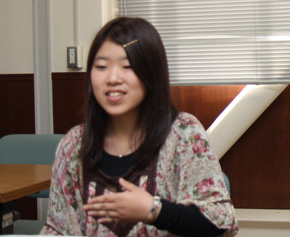 Kinanthi san, do you have some advice for your juniors who wish to study abroad, maybe in Japan? Kinanthi: Well, I think they have to really prepare themselves because studying abroad is not easy. We have to prepare our knowledge and also our feelings too, because as you may know, experiencing new things in Japan sometimes means many troubles. So it’s not easy but if you are motivated enough to come to Japan and study, I think you should come because it’s a very good chance for you. Thank you. Next, there must be some students out there who would like to study abroad but can’t make the decision yet. Could you encourage them to be brave? Kato: First you should take the chance to go, anyway. When you are there you will experience that the people will try to listen to you, although you don’t speak their language fluently. Try to speak and think “Oh, great!” when the communication is successful. But the most important thing is to brace yourself and make up your mind to go. Kinanthi: I think if your problem is the language, for example maybe you cannot speak other languages, it actually doesn’t matter! In my case, my mother language is not English and my English ability is not really good but I always try to speak and challenge myself to speak English. So if you want to try, all you have to do is just try. What’s the most important thing for international exchange for you? Kinanthi: For me, maybe the important thing is to respect and understand each other. As you may already know, we have different cultures, but if we can respect each other and understand each other, our friendship will last long. We can have a very good relationship with each other. Kato: I agree with that. You shouldn’t compare your own culture with other cultures and decide which one is correct. It is very important to be interested in your partner’s culture and to understand it. Some things turn out to be interesting if you actively try to understand them and you find differences. There is a lot to discover and it can be fun. The most essential thing is the feeling of being interested towards others and to accept them as your friends. Last question. 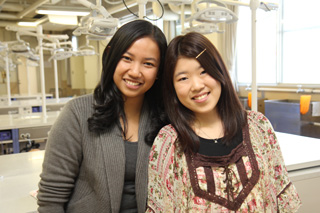 In this globalized environment, you two are becoming dentists in the future. What kind of dentist or international leader would you like to become in the future? Kato: I am also interested in research. I want to become a scientist who goes to international conferences, reads papers and is able to be active even in foreign countries. Also I think that it is very advantageous for me to have friends in Indonesia and Vietnam. So even after their return, I would like to contact them frequently, and hope that we will able to do something wonderful together in the future. Kinanthi: Actually, I want to be a practicing dentist who treats patients as well as an international researcher who works in a university. I want to go to other countries and attend some conferences about dentistry. Actually one more thing I want to do is volunteer work. For example, my country is still developing and many people including children are still under difficult situations to get proper treatment for medical or dental health. To support such underprivileged people, I want to make some foundations to do volunteer work and eventually I want to contribute to build a system to support such people. That’s what I want to do in the future.